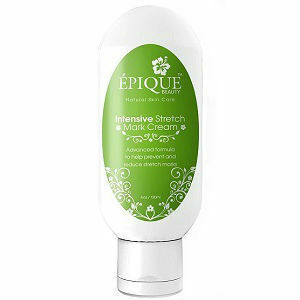 This is our Épique Beauty Intensive Stretch Mark Cream review. The Épique stretch mark cream is a formula designed to help with stretch marks and scarring, particularly during pregnancy. It claims to tighten, moisturise, and nourish skin, repairing and protecting against later problems by feeding your skin a rich diet of natural oils and butters to encourage regeneration of cells, and increased collagen production. For more about ingredients, prices, and more, please read on. The active ingredients are all natural miracles for moisturising deep within your skin’s layers and include a range of natural butters, as well as essential oil extracts which are not only a dream for your health, but which smell incredible too. The Aloe leaf juice leaves a warming, massaging effect when applied, and works as a great accompaniment or replacement to deionized water as the first ingredient. It’s hard to nail down a precise daily dosage, and it isn’t really necessary to. The dose will depend on your size, the amount of skin which is affected, and how many parts of your body need attention. The directions advise that you apply twice daily to freshly cleaned skin, by massaging gently. There is really little risk with the Épique Beauty formula. You should always read the ingredients before you apply though, and if any irritation occurs you should immediately discontinue use. On the Épique website the product usually retails for $50. However, it is often available on promotion, and can be picked up for a modest $20! This is another product that comes with a full warranty. If you simply find that the product doesn’t really work for you then you are never going to be stuck with it, and Épique are really lovely to deal with. Just send the product back in original packaging, and your money will be refunded, no questions. Unlike other oil based options we’ve tried before, the stretch mark cream by Epique really does sink into the skin, which is great! Plus it means you’ll never find greasy residue rubbing off onto your clothing. And it does come complete with a money back guarantee. However, while they clearly state their guarantee, there’s no indication anywhere of how long you have to return it. This might be a little worrying if you’ve been left dissatisfied. As with any cream, not everyone seems to have the desired results. Without any specialist dermatological ingredients, $50 is fairly expensive for what is being offered. Many brands out there now are offering clinical products starting around the $50 mark. Due to these concerns, you might be better off searching a bit more for the stretch mark product best suited for your needs. David Carney	reviewed Épique Beauty Stretch Mark Cream Review	on August 5th	 and gave it a rating of 3.5.